As my photography business builds up steam, I find it increasingly useful to have an assistant. Someone to hold lights or bounces, notice the model's collar standing up, or chime in with an inspired (artist's eye) suggestion. In may case, I am fortunate that my assistant is also my lovely wife. In exchange for her labors, she gets to travel to exotic locations to assist me in my work. 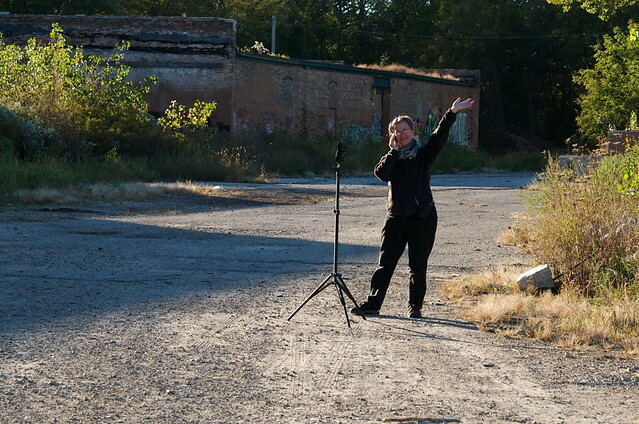 She gets to work not only in the studio, but in abandoned, derelict building lots. The dreams, the aspirations needed to take her there! OK, some days are better than others, and our location shoots aren't really all that exotic - yet. But her help is indeed appreciated, and her soft touch with clients is truly appreciated. Thanks for all you do, Reena.